The JS9000 is very similar in features to the JS8500 series below it with the exception that it has the curved screen and slightly different design than the JS8000. These are the 2nd highest grade TVs from Samsung for the year. The JS9000 is one of Samsung's new “SUHD” TVs for the year and sells for a considerable discount to the highest end JS9500 series above it. This shot demonstrates amazing clarity of detail, color, and contrast. Though there are inherent weaknesses with Edge-Lit LED lighting, Samsung has the brightest LEDs in the market. The powerful LEDs really give the JS9000 a step up in terms of black levels and especially peak whites and light flow through colors. While it does not compare to the top tier full array backlight options from Samsung or Sony, it's all you probably will need. Light flow through is the most exceptional aspect of Samsung's LED TVs and you will see this standout feauture when viewing onscreen scenes with natual light coming into rooms. 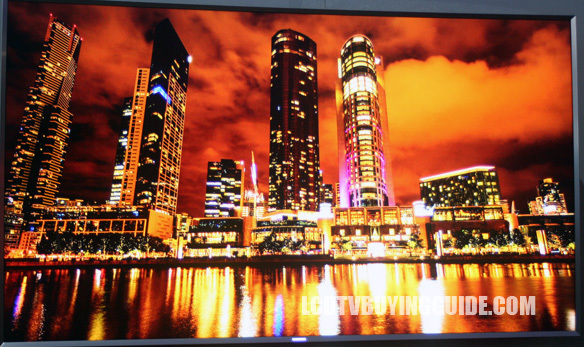 Contrast is also very strong with these SUHD Samsung TVs. Read more about that and color below in the Nano Crystal section. Samsung's new term for edge lit dimming is UHD Dimming a replacement for Micro Dimming. There is a lot of precision regarding contrast, color, and detail levels needed for each part of the screen to coordinate and excellent overall image. It's never been one of the best features to me. I like the full boat full array micro dimming much better which has a major impact on contrast. The manipulation of the edge lighting as in the JS9000 to my eyes only marginally impacts color and contrast in the picture. Strong contrast and light flow through are seen in this shot. Ever wonder if the picture quality is better on a 4K UHD TV with a standard definition or HD signal pumped into it? The answer is yes ONLY if the TV has a stellar upscaling and conversion technology built in. The JS9000 analyzes the incoming signal, applies video noise reduction techniques, and scales up the lower resolution signal. Lastly, it enhances the detail which may be the most important bit. Anyway, the end result is that yes, you get a much better picture. I would place Samsung second behind only Sony in this regard, but it also depends on which model of TV. This is one of the differences from the very top end TVs. 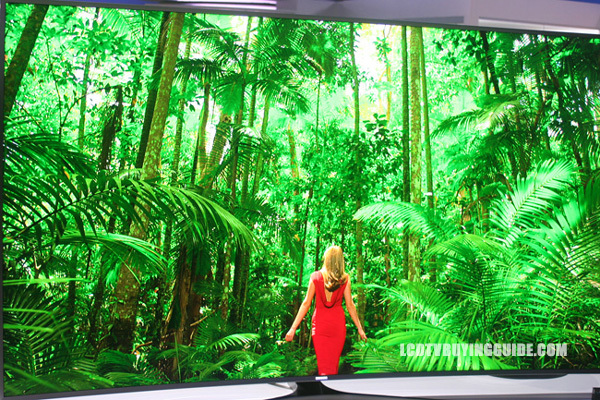 For 2015 and 2016 Samsung has a new moniker for it's 4K TVs. Why be plain when you can spice things up a bit? It's SUHD! And the “S” stands for Super. Alright, here are the particulars on what makes an SUHD. First, there is a new color system used called DCI P3 which has a wider color gamut or spectrum or pallet – call it what you will it's a bigger range of colors, more Crayolas in the box. That color is dispursed and enhanced further by Nano Crystal Technology which is a competing technology to Quantum Dot technology used by some of the other OEMs. The combination of the two does improve the color. It comes across more refined, cleaner and more defined than the previous 4K TVs. To me, it's a 10% improvement in color representation. Next, the SUHD lineup has a brighter backlight which is capable of hitting 1000 nits at peak brightness and produce deeper blacks as well, though this is more difficult to discern. Last, all SUHD TVs in Samsung's lineup have the proprietary Samsung developed Tizen operating system for Smart TV though that's not part of what differentiates an SUHD. SUHD is all about those upgraded picture quality features, especially the wider color gamut. Nano Crystal Technology is at the heart of improvements in color for the JS9000. All SUHD models by Samsung for 2015 and 2016 enjoy this new technology. This is Samsung's version of Quantum Dot technology. The Nano crystal layer (called the QDEF layer) is a stack of ultra thin film located between the LCDs (liquid crystals) or LEDs and the front protective glass or plexi layer. The benefits of the technology are a wider color gamut (more colors) produced by better disbursement through the Nano Crystal Diffuser Film. Think of the Nano Cystal layer as a color converter which assists the LCDs in creating more colors. Nano Crystal and Quantum Dot technology are thought of as competing technologies with OLEDs (organic light emitting diodes) which carry their own color to the surface of the panel. The Auto Motion Plus feature in the UN55JS9000 is something that comes as a blessing and a curse. By default it is set to On in all of the preset picture setting modes. You should turn it off for streaming content, DVDs, Blu-rays, and TV shows. You end up with the dreaded 'Soap Opera' effect, making images look terribly unrealistic by eliminating natural background blur. Turn it off in the Picture Options menu and everything will be fine again. You'll immediately see judder when you disable it, but your eyes will adjust momentarily. We've noticed that it actually helps when it comes to displaying 3D content and sports programming. When viewing 480i based content we saw slight improvements when the setting was low as well. Just be familiar with how to adjust this and it won't be a problem. This figure represents an enhanced Hz rate for the 240Hz panel. By manipulating the powerful LEDs Samsung is able to produce an “effectively” faster refresh rate. The Samsung JS9000 comes with only 4 preset picture modes which are Movie, Standard, Vivid, and Game. Obviously, Game mode is your choice to cut down on motion lag from games. The included black touchpad Remote Control is light, and easy to operate whizzing around the Tizen Smart Hub menu system. The point and click operation is a plus. On the negative side, the remote is small and takes a lot of getting used to. The functions on the remote itself are very limited. This year's touch remote has plenty of surface for swiping your thumb to move the cursor but there are few buttons and it takes a while to get used to. 3D looks amazing with incredible depth and little crosstalk on the JS9000. A quick look at Avatar in 3D had me glued to my seat. The picture settings automatically change when switching to 3D viewing, but just leave it in the preset juiced 3D picture settings as this is the best way to watch it. The JS9000 comes with 1 pair of 3D glasses at the ready. The 3D on a 4K (oh excuse me, SUHD) TV is excellent. It's one of the only TVs in the market that includes 3D functionality. It seems chintzy to force people to purchase glasses (by including just one pair). For those needing extra glasses, the SSG-5150GB are compatible and sell for around $18 – not too bad. This is the difference with the JS8500 below it, the JS9000 has a metal charcoal framing bezel and a curved screen. Some say the curved screen helps with side angle viewing quality. We dont think it helps much, but the look is novel and somewhat more enveloping from front and center. If the curved screen appearance appeals to you then go for it. The accompanying T-shaped stand is also brushed charcoal and has a modern touch. 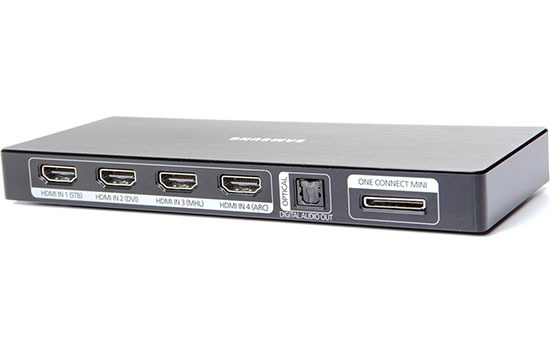 In order to keep the super slim 1.2” depth, the TV ships with a One Connect Mini box which is your input connection for HDMI and USB inputs. For me, 2” or even 2.5” is fine depth-wise on a TV. I dont need 1”. I would rather have more depth and better speakers. But the external box does somewhat simplify connection if you have multiple inputs with longer runs and are wall mounting the TV. For $2499 the 55JS9000 you pay around $500 for the curved screen on the JS9000 over the JS8500. 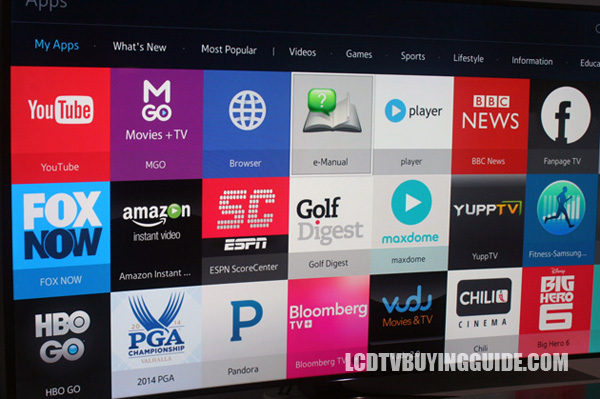 This is a feature packed very solid performing 4K UHD TV. You may not like the sound quality, upconversion from poorer low res content, or the remote key functions, but the TV has great picture quality from the ultra clear pro panel with enhanced color and contrast. 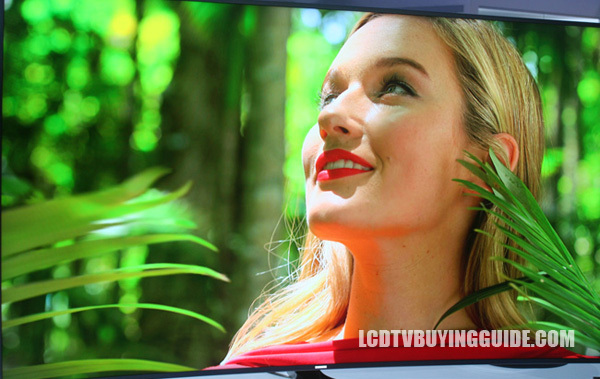 It's not as good as the JS9500 picture, but this TV sells for a big discount. Best competition for this model is the high end Sony's like the XBR55X900C. Dimensions TV w/ stand: 49" x 31.1" x 12.7"
TV Only: 49" x 28.1" x 3.6"